Rats in attic? Rats in the garage? Rats under the house? Rats in the house? Get rid of rats, don’t control rats. 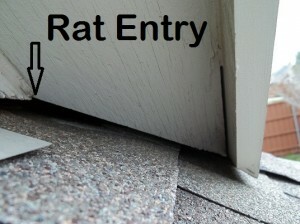 Effective rat proofing and trapping does not involve poisons. Have you ever put rat poison out then had a bad smell coming from a wall? Thats why we do not do that method. Rats fall under both Wildlife Removal and the Pest Control Industry. 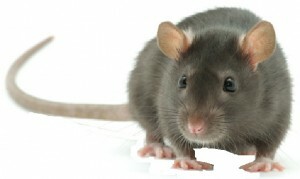 The wildlife removal industry does proper rat removal and proofing by proofing (sealing) the entire house or structure. After the proofing is complete, set the traps. Live catch or kill traps are set until all the rats left inside are trapped. Once all the rats are eliminated a thorough clean up and sanitizing must be performed. Rotting feces and urine soaked insulation is a biohazard. Pest Control is exactly that, control. Wildlife Removal services provide an answer by providing an elimination proccess to get rid of the rats, not controllig them. Once the rats are completely sealed out of the house or structure then Pest Control can have rat boxes set on the perimeter of the building for future rats.